In the four decades before these words were published, there had been an explosion of newspapers throughout America, from the great cities to the tiniest towns. In 1810 there were between 150 and 200 newspapers in America; by 1835, over 1,200. People read them voraciously. Shop clerks would put down their newspapers to give you change, and lawyers would check them out in court between motions. In addition to news, they contained poetry, biography, and literary criticism, and nearly all of them were ferociously partisan. By 1822 there were more newspaper readers in America than in any other country in the world. The rise of newspapers was fueled by several technological innovations that occurred within a short period of time. 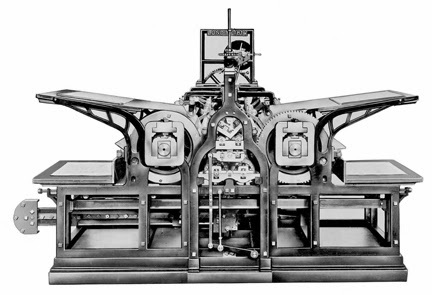 In 1814 the first steam-driven cylinder press was put into service by the New York Times, making it possible to increase the speed of printing from a mere 250 to over 1000 pages per hour, and up to 2000 per hour by 1825. 1816 saw the first paper produced as a continuous roll, rather than as single sheets. At the same time, the rise of steamboat travel made it possible to transport the new papers far more quickly from one state to another, increasing the speed at which news could be shared by the entire country. As the new Western states, one after another, established universal (white male) suffrage, the new availability of newspapers helped to make democracy a reality. The Post Office charged far less per piece for printed material than for personal letters, and it permitted newspaper editors across the country to exchange copies of their papers for free, enabling small local papers to pass on to their subscribers the news of distant cities. Newspapers reprinted Congressional speeches, printed letters from Congressmen to their constituents, and served as forums for fiercely contested arguments on issues of national consequence. In this way they not only strengthened representative government, but also helped to enlarge their readers’ understanding of themselves, from members of small local communities to citizens of a nation. Frances Trollope, of course, disapproved. As always, the disapproval of English travelers provides a measure of the gulf that had long since opened up between the societies of the Old and New Worlds. With amused disdain, she recorded the opinion of a politically engaged American citizen, who asked, “How should freemen spend their time, but looking after their government, and watching that them fellers as we gives offices to, doos their duty, and gives themselves no airs?” To Trollope, a person like that citizen had no business having an opinion about whether members of his government did their duty or not. A final indication of the power of print can be seen in the swift passage, in the early 1830s, of numerous state laws forbidding anyone to teach slaves to read. These laws were primarily a reaction to Nat Turner’s brief by bloody slave rebellion, but they also reflected the slaveowners’ understanding of the increasing availability of printed information, and their realization that the more information a person had about his or her world, the more difficult it would be to keep that person under control.